Late Sunday night, scientists at NASA’s Jet Propulsion Laboratory in Pasadena cheered as the Curiosity lander ended its 352 million-mile journey, arriving – intact – onto the surface of Mars. The nail-biting landing procedure had been called the “Seven Minutes of Terror,” based on how long it took the lander to cut its speed from 13 thousand miles an hour… to zero. For scientists at NASA Ames in Moffet Field, the work is just beginning. NASA Ames senior scientist David Blake designed CheMin, one of the scientific instruments that hitched a ride to Mars aboard Curiosity. 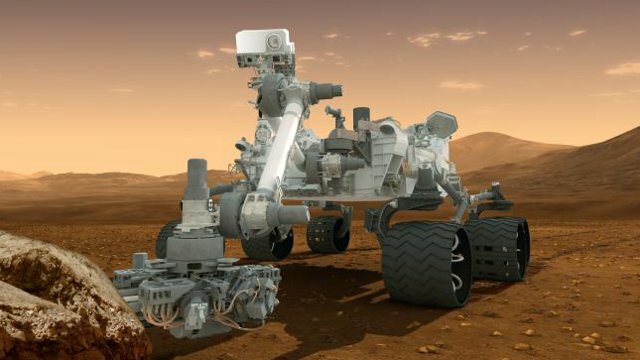 CheMin, short for Chemistry & Mineralogy, uses x-ray diffraction to analyze soil and rock samples that the nuclear-powered rover will collect as it explores the Martian surface. That data, which will be transmitted back to Earth, may help scientists solve one of the Red Planet’s most compelling mysteries: whether water once flowed over its now-parched surface. The mission is expected to last two years, but could go on much longer, depending on Curiosity’s life span. The lander can meander up to 12 miles over the Martian surface, with a speed limit of about 300 feet per hour. 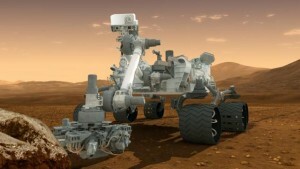 All the while, Curiosity’s 17 cameras are designed to stream images back to Earth of what it finds. KQED News anchor Joshua Johnson spoke with NASA’s David Blake just hours after the landing. Johnson: Congratulations, first of all. I’m sure you were up all night watching the landing. Blake: Well, yeah, to say it was exciting is an understatement. You know once the vehicle hit the atmosphere of Mars, and things went so fast, it was almost like your brain couldn’t follow, and when those first thumbnails came down, it was just pandemonium. Everybody just erupted and started screaming and hugging each other. Johnson: I imagine that seven minutes started to feel like seven seconds as the time slowed down. Blake: It was amazing, and the control room was live saying ‘OK the heat shield has been released. OK the parachute has been deployed. The sky crane is operating.’ It was just unbelievable. Johnson: So tell me a little bit about where Curiosity landed? Why did you choose this particular spot? And did the lander hit its mark? Blake: Well, we think it did. We don’t know exactly where it landed but its certain it landed within the ellipse. Gale Crater is one of the oldest and deepest craters on Mars and we know that very early on Mars’ time it filled to the brim with sediment and that sediment solidified to make a rock and then later on a lot of that sediment was eroded out by wind and we are left with this big mountain in the middle called, we call it Mount Sharp. And Mount Sharp is 5,000 meters of stratify sediment and the geologist can basically read this like a book, so we are going to start from the bottom and work our way up and this will tell us a lot about the conditions of very early Mars. Johnson: It sounds like, to put this in some perspective, it’s almost like landing this device at the bottom of the Grand Canyon. Is what it sounds like. Blake: Yeah, it is very similar, similar distance down, actually greater distance of strata. And so the rover planners have actually figured out, they figured this out from pictures long ago, long ago being months, where we are going to go if we land where we say we did and going up in a canyon and to the left and to the right So they have the plans of where to go already done. Johnson: Here in the Bay Area it sounds like scientists worked on one aspect of the lander, in particular called CheMin. Describe what CheMin is and how it works? Blake: Well CheMin is one of two laboratory quality instruments that’s inside the body of the rover, and what CheMin does is it determines the mineralogy of all the sediments, or the drilled rock, that is delivered to it by the arm of the rover. And the interesting thing about minerals is that, if you know the minerals that are present in a rock, you can say what the environment was in which the rock formed. And so, what CheMin will do is it will tell you the conditions of formation of these rocks that are 3.5 – 4 billion years old in Gale Crater on Mount Sharp. Johnson: And that would also include if there was once water there, right? Blake: Well, that’s exactly right. We know from orbital assets that like the CRISM instrument on Mars’ reconnaissance orbiter that there are hydrated minerals, such as clays and hydrated sulfates, that are present where we are. And these hydrated minerals, we will be able to tell them with CheMin very easily. And these hydrated minerals tell us that there very likely was a habitable environment – that is, an environment where life could have begun or could have persisted over time very early in Mars history. Johnson: Let’s finish with the two big questions, how soon do we see results and how soon do we send people to Mars? Blake: We are going to get pictures back really continuously starting last night and certainly today. My instrument would not really deliver a result for probably three weeks to a month, and the reason being is that engineers are testing everything out, and we are kind of in the last of a first time use series. So by the time everything is checked out and the arm and the drill, then they will deliver a sample to us. Johnson: And in terms of sending people to Mars? That’s a long ways off I imagine. Blake: That’s kind of at the end of the chart. We are a step along the way. That’s just a huge challenge even compared to this, which was, to me, other worldly. Johnson: Well it’s incredible that you got this far. Congratulations, David Blake is senior scientist at NASA AMES, in Moffett Field. Thank you for talking with us, and again, congratulations. Blake: Well thank you. It was very enjoyable. Curiosity will land near the foot of Mt. Sharp, inside Gale Crater. 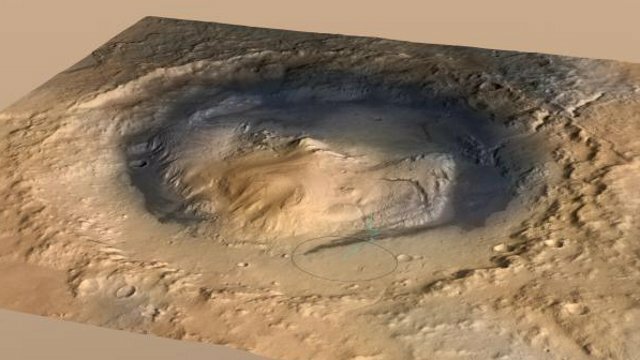 Over its two-year mission, Curiosity will explore the crater and mountain to investigate whether this area of Mars has ever offered conditions favorable for life. 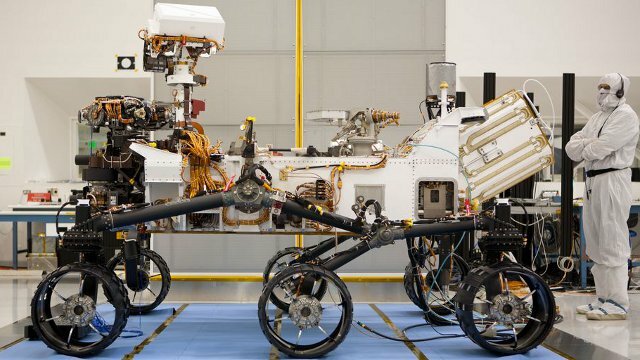 About the size of a small SUV, NASA's Curiosity rover has six-wheel drive and the ability to turn in place a full 360 degrees, as well as the agility to climb steep hills. 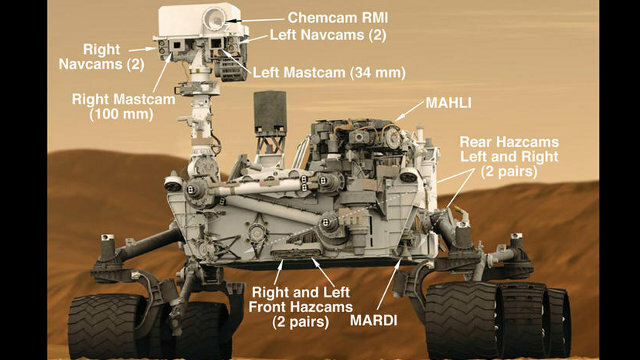 Curiosity is equipped with 17 cameras, and the capability to send high-definition images of the Martian surface back to Earth.